The West Hill - Highland Creek Lions teamed up with the Toronto Firefighters Association to give 3 year old Zachary Raymant, who suffers from Cerebral Palsy, a new bicycle. The special bicycle includes straps and adjustments to keep him safe but mobile. He and his brothers and sisters also got a tour of the fire station. The CBC news story about the presentation is available at http://dl.dropbox.com/u/45201468/CBC%20News%20-%20Zachary%20story.avi. The West Hill - Highland Creek Lions teamed up with the West Hill Social Activity Club and the Heron Park Community Centre once again to host their annual Breakfast with Santa. As usual, the tickets sold out quickly as over 100 children and their parent(s) came out for a pancake breakfast, presents and a photo with Santa. The Lions would again like to thank the local Country Style concession for donating hot dog & drink tickets to the club, who were able to sell them all by 1:00 PM. 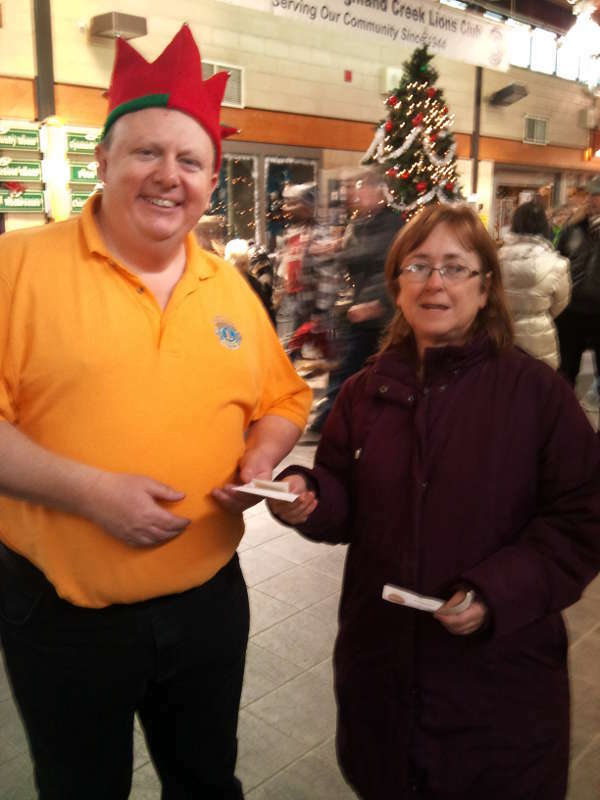 The Lions 50/50 draw also took in $481, with winner Helen McLaughlin taking home half that amount. The other half will go toward Lions projects in the community. The West Hill - Highland Creek Lions celebrated their 68th anniversary with a Greek-themed dinner. On hand were a number of district celebrities including IPDG Ilkka Ahola, DS PDG Rollie dela Cruz, Region 7 chair Ray Charbonneau and Zone 58B chair Bob Knox. Members from several other Lions Clubs and friends and family members of the Lions also helped celebrate the event. 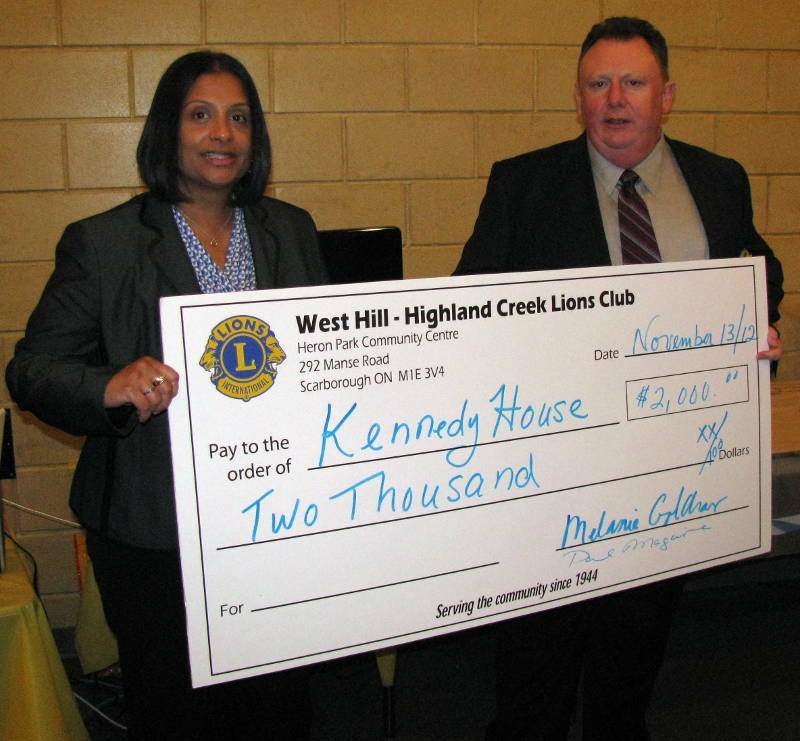 After dinner, the Lions were pleased to present Shelly Jaigobin from Kennedy House with a cheque for $2,000 toward their afterschool program for at-risk youth. This was followed by a presentation on vacationing in Greece by Mark Crone from Graham's Travel and videos showing Greek dancing. A 50/50 draw was held that raised $123.50 for the Dog Guides. Lion Secretary Melanie was the winner. Graham's Travel also held a draw for travel bag they donated, which was won by guest Sylvia Cannon. The West Hill - Highland Creek Lions Club presented its annual Community Service Award to graduating students at Sir Oliver Mowat CI and West Hill CI. 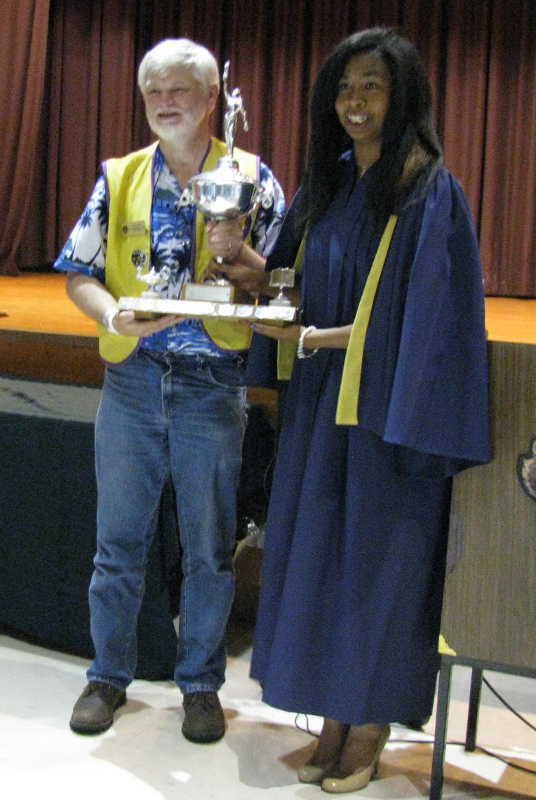 Pictured is Lion Gary presenting the award, worth $300, to Devina Persaud at West Hill CI. 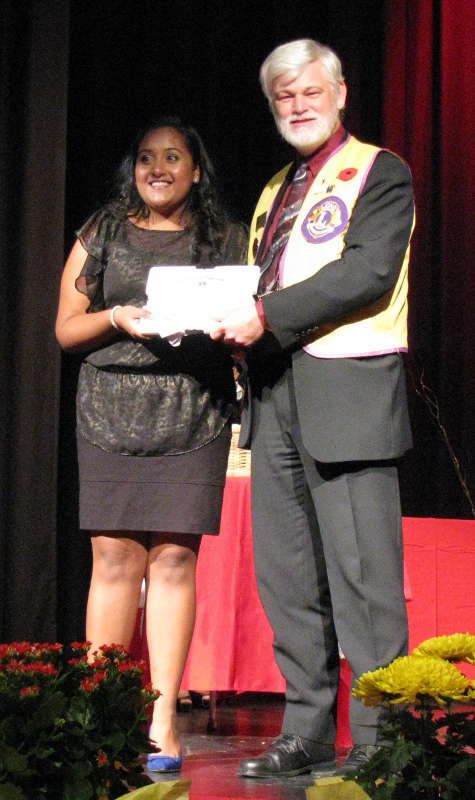 Lion President Paul presented a similar award to Kajaniya Kajendran at Sir Oliver Mowat CI. 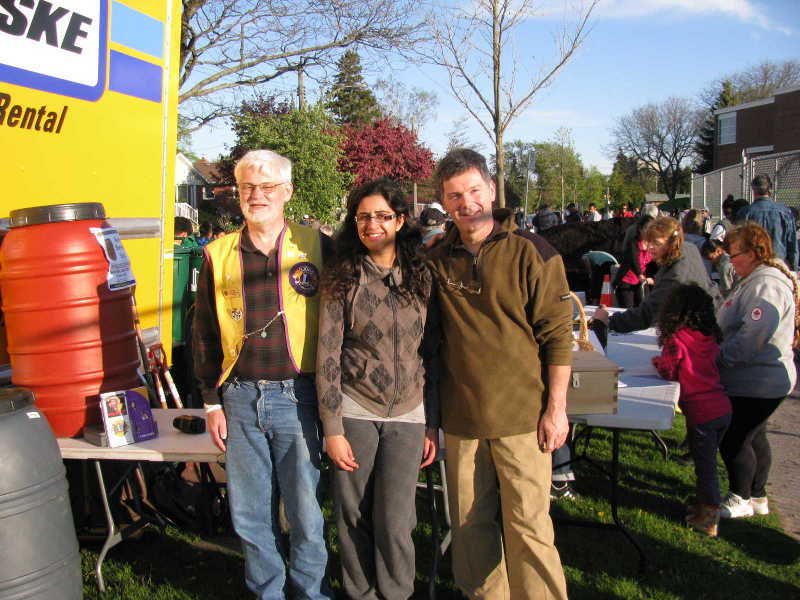 Members of the West Hill - Highland Creek Lions Club once again ran the children's mini-circuit ride at the West Rouge Sports & Recreation Association's Family Day event. They also sold 50/50 draw tickets at their table and during a dog guide demonstration they had arranged. 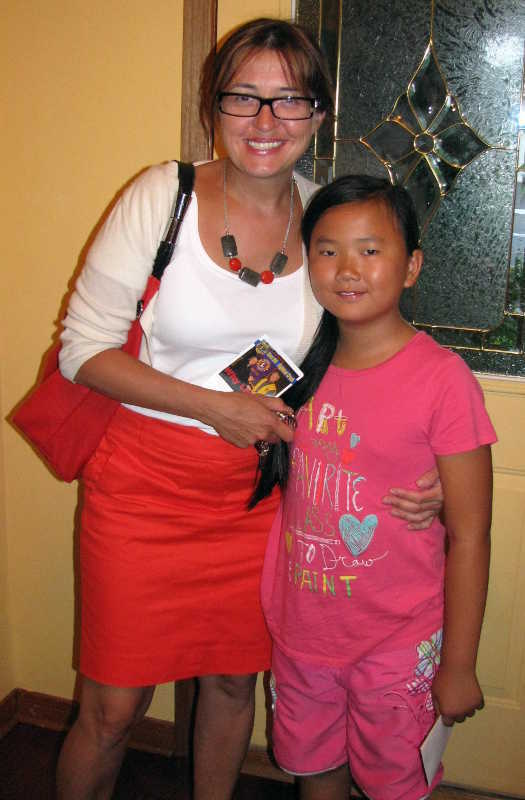 Tanya Kobayashi was the winner. The West Hill - Highland Creek Lions Club held its annual 5 & 10k run/walk as part of the Port Union Waterfront Festival. Despite a significant glitch at a key marshalling point, most participants had a great time as a record number of people joined in. 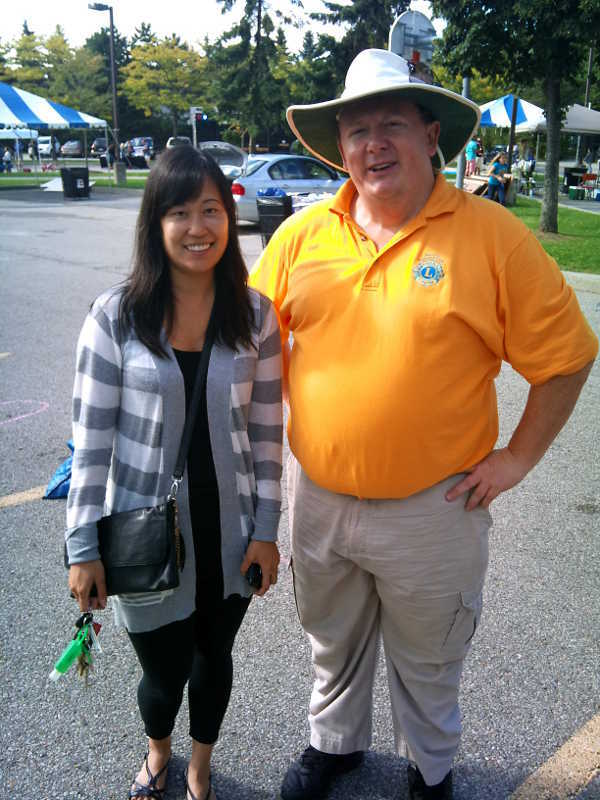 The Lions continued with a table at the festival and also volunteered at several of the festival events. They also held a 50/50 draw to raise money for the Dog Guides. The winner, Kasia, donated part of her winnings back to the dog guides. The West Hill - Highland Creek Lions were pleased to present the Maplewood High School Principal's Award, given to the outstanding graduating student, to this year's winner and valedictorian Victoria Dagossy. We wish Victoria and all the graduates continued success in all of their future endeavours. 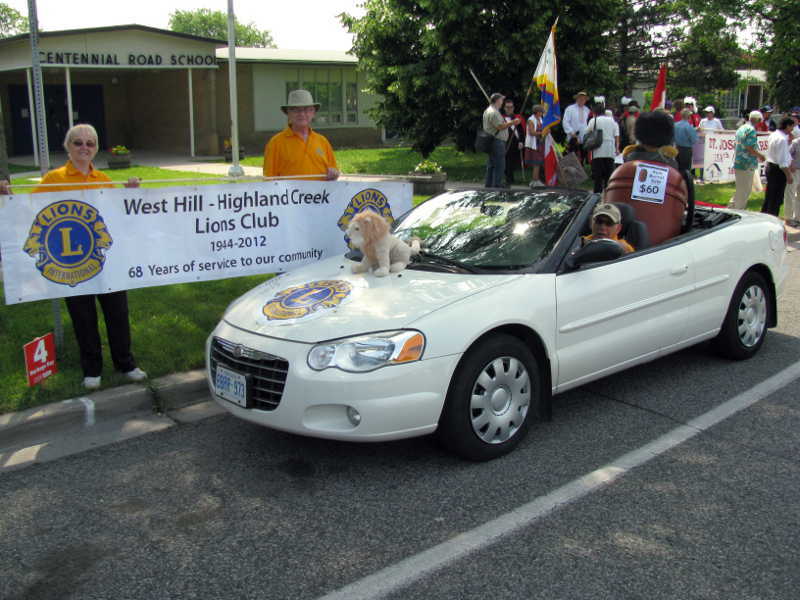 The West Hill - Highland Creek Lions Club once more participated in the Highland Creek Heritage Day parade. Following the parade, they set up and ran the children's area (featuring mini-circuit rides, popcorn & candy floss) and sold the last of their rain barrels for the year. They also held a 50/50 draw to raise money for the Dog Guides. The winner, Ed Peabody, also graciously donated his winnings to the Dog Guides! 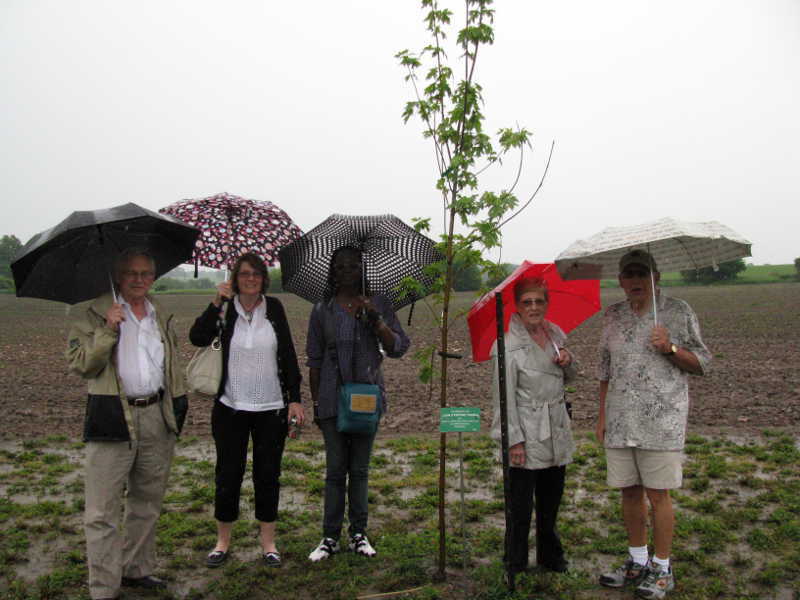 Members of the West Hill - Highland Creek Lions Club and Andrea Thorn attended the dedication ceremony for a tree planted in Lion Cynthia Thorn's memory at the Lions Memorial Forest in Breslau, Ontario. This would have been Lion Cynthia's 77thbirthday. The West Hill - Highland Creek Lions Club were pleased to participate in the West Rouge Sports & Recreation Association's first annual Parking Lot Sale. The Lions brought in a fresh delivery of rain barrels with enough to fill orders from Councillor DeBaeremaeker's events as well as walk-in sales. 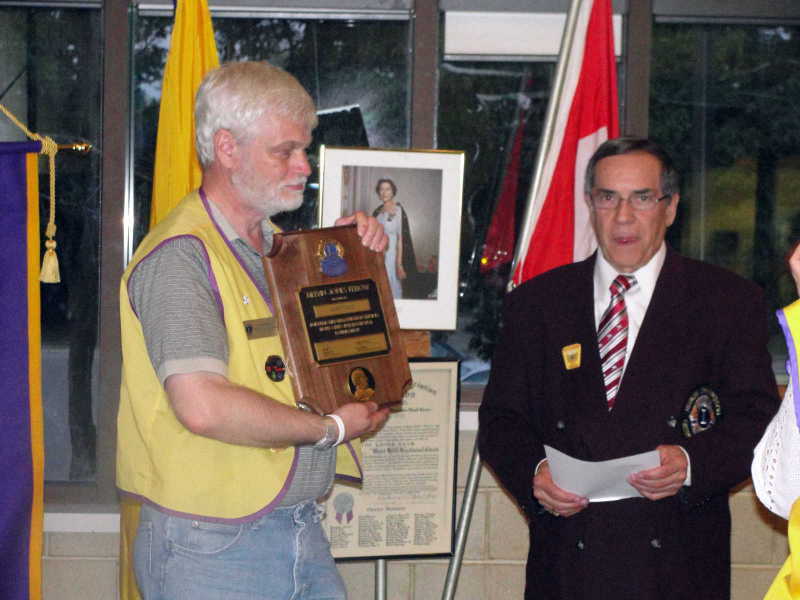 The West Hill - Highland Creek Lions Club were host to district officers as we inducted two new members, installed the club officers for the next Lions year and presented Lion Gary with a Melvin Jones Fellowship. 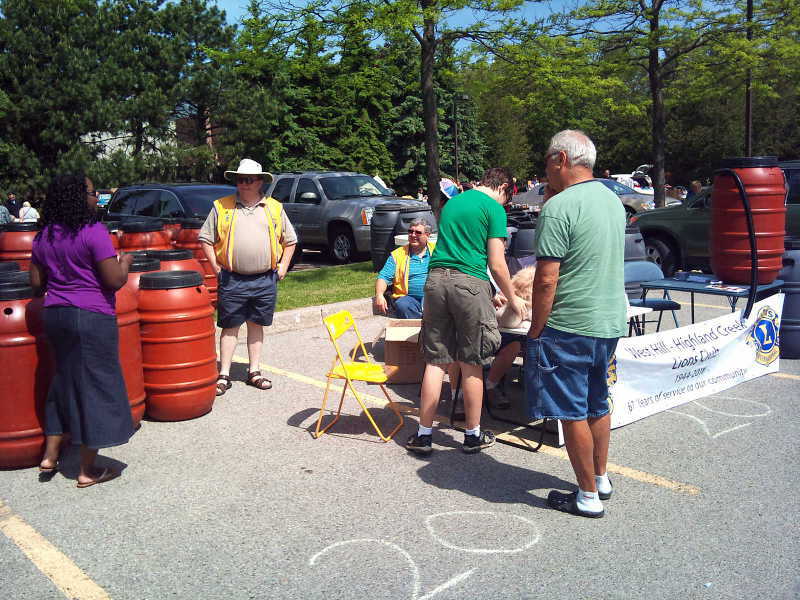 The West Hill - Highland Creek Lions partnered with Toronto City Councillor Glen DeBaeremaeker to sell rain barrels at a series of community compost give-aways he arranged. While the Lions ran out of rain barrels early on in the sale, they continued to take orders for later pickup. The West Hill - Highland Creek Lions rain barrel was not without its problems. The truck was two hours late delivering the barrels, forcing many people to come back a second time to pick up their barrels. To compensate, the sale stayed open past 3:00 PM to ensure that everyone was served. In total, 74 barrels were sold. In addition to helping the environment, profits from the sale will be put toward Lions projects in our community. 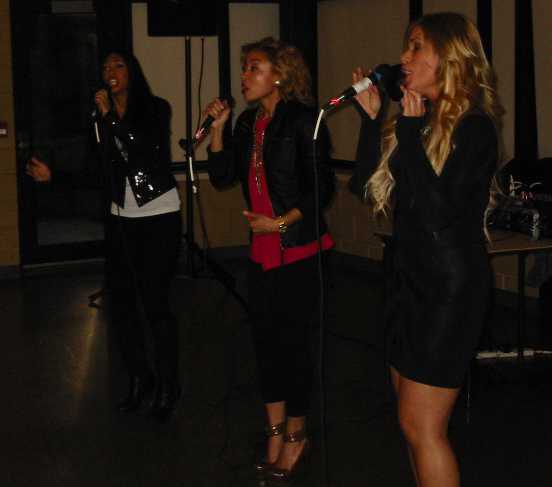 The West Hill - Highland Creek Lions were pleased to present Toronto musical group Queen of Hearts at their annual Spaghetti Night and Community Awards Dinner held to honour the contributions of our community partners. This year's recepients were local activists Darlene Howard and Pat Matheson. 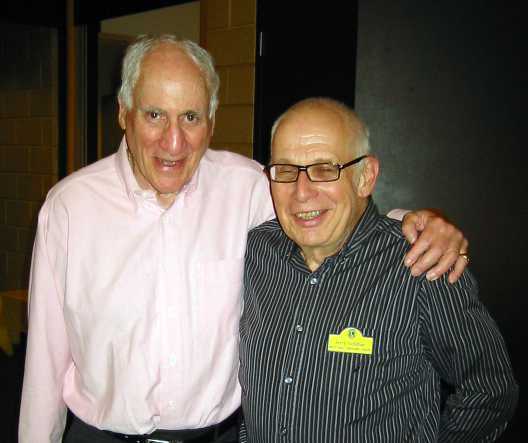 To cap of the evening, consumer advocate and broadcaster Peter Silverman gave an informative and entertaining talk using some of his more memorable cases to highlight issues that all consumers should understand. 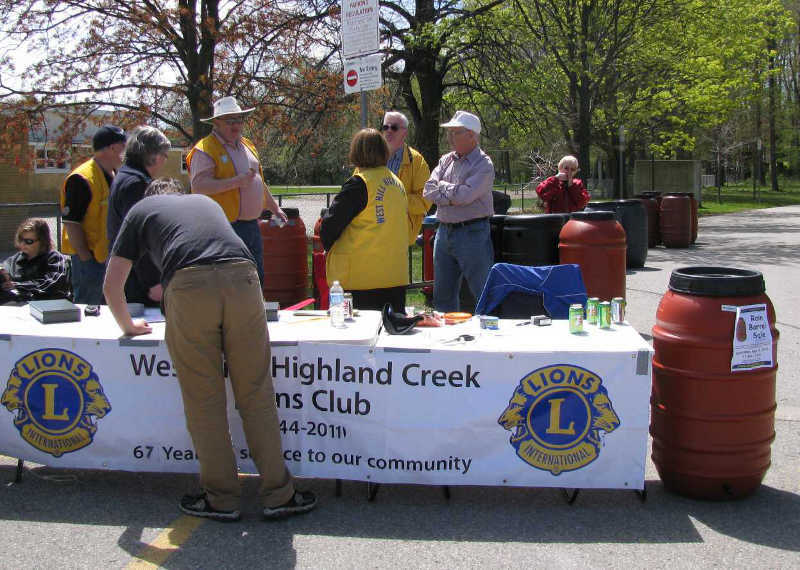 The West Hill - Highland Creek Lions were at the YMCA's Eco-fair to promote their upcoming rain barrel sale. 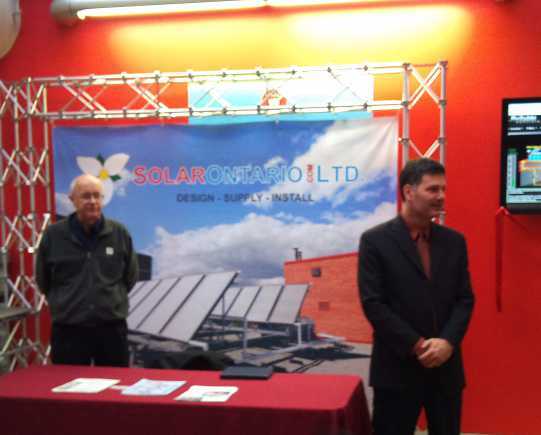 The Eco-fair was held to celebrate the YMCA's new solar energy system which will provide most of the hot water they use. The West Hill - Highland Creek Lions worked with City staff and the Tam Heather Curling Club to organize a second round of the very popular Little Rocks curling event held at last year's Port Union Winterfest. Unfortunately, the weather didn't cooperate as it was too warm to make ice outdoors. However, the Lions found other ways to serve, including promoting their upcoming rain barrel sale and serving popcorn to the event's visitors.